Carrie has been with our office the longest. She joined our practice in 1989. 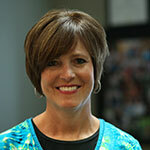 Carrie graduated from Raymond Walter’s dental hygiene program in 1985. She has a great reputation here for her deep caring for her patients. She and her husband Tom have two grown sons and one grand dog named Vinne.